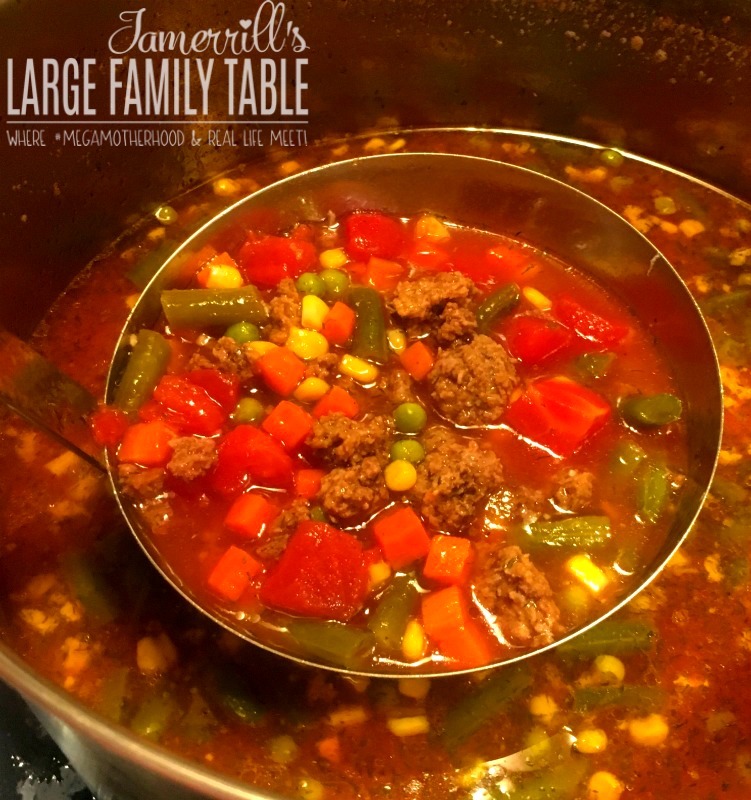 We love good large family freezer meal soup recipes around here! This classic Vegetable Beef Soup is sure to be a winner at your house. Serve alongside a big green salad or a hot grilled cheese sandwich if you’d like. 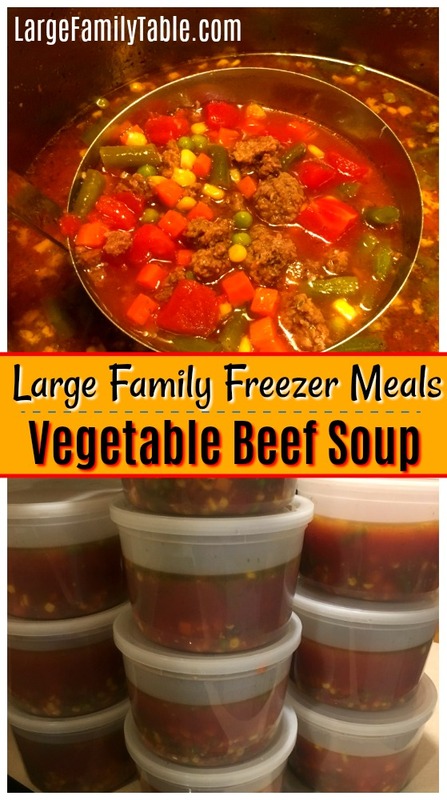 This Vegetable Beef Soup is one of two freezer meal soup recipes that I made during my last large family freezer meals prep day. 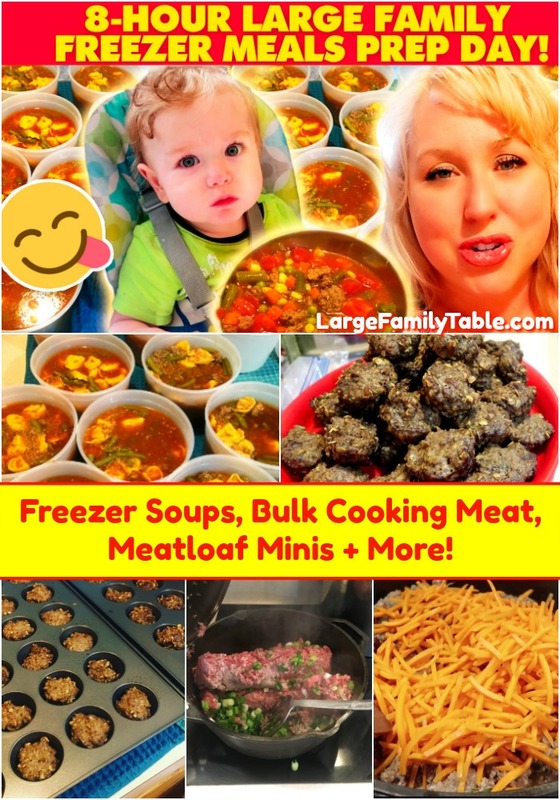 On this freezer cooking day, I batch cooked over 50 lbs of various meats for many large family freezer meal recipes and made the two stock pots full of freezer meal soups, plus over 120 miniature meatloaves. It was a jam-packed, but successful 8-hour freezer cooking day. 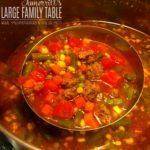 This hearty Vegetable Beef Soup is one of my favorite freezer meal soup recipes. Perfect for any time of year, easy to freeze, and quick to reheat – it’s sure to please! In large pan cook 4 lbs of lean ground beef with one diced onion and 5 diced celery stalks until fully cooked. Crumble and drain. In large stock pot combined 4 lbs of cooked, crumbled, and drained ground beef, 6 quarts broth, 4 29-oz cans of crushed tomatoes, 1 tbs dill weed, and 80 oz bag on frozen peas, corn, carrots. Simmer on medium heat stirring gently as needed. Once soup is safely cooled scoop into freezer safe soup containers. Leave room for soup to expand during freezing. Here is my Amazon affiliate link for the freezer soup containers I used this go round. Store soup for up to 3-months in the freezer. For use just set out into the refrigerator the night before or morning before needed. Reheat the soup in the microwave or on the stove top when needed. I’ve even reheated my freezer meal soup recipes in the slow cooker on low heat for up to two hours. Serve as a full meal or with green salad and sandwich! Be sure to let me know in the comments some of your favorite freezer meal soup recipes! Here are just a few of my recent large family freezer cooking days. I hope you find them helpful! 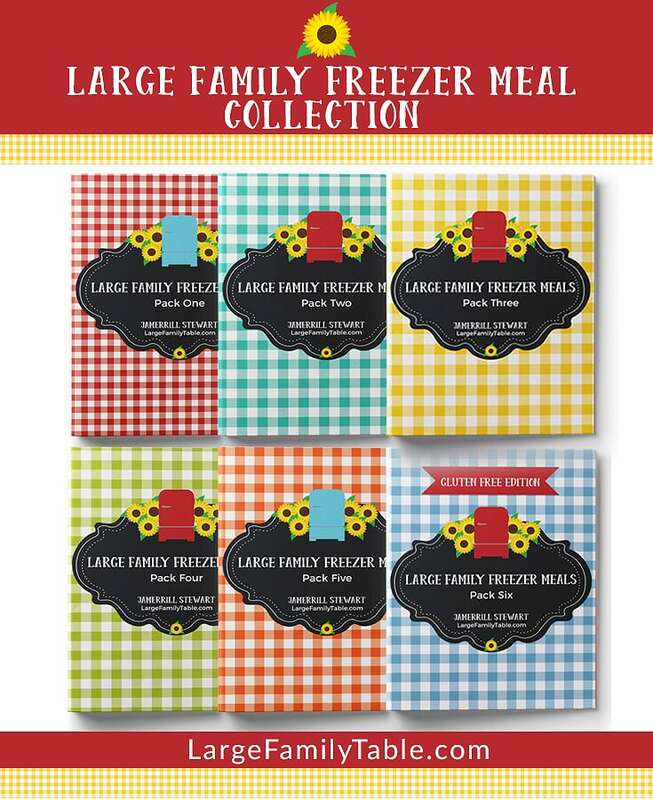 This large family freezer meal was featured in my 8-Hour Large Family Freezer Cooking Day post and video.